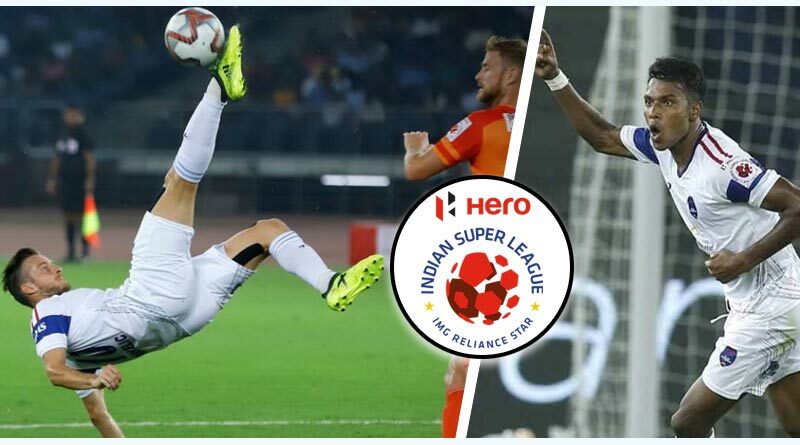 Coming back to ISL 2018-19 Delhi Dynamos Vs Pune City, Delhi was left rueing their poor finishing when the final whistle blew at the Jawaharlal Nehru stadium. A match that was dominated by Delhi ended up as a draw after Pune City scored a late equaliser to rob the hosts of the three points. Playing their opening match in front of a 10,000 strong home crowd, Delhi Dynamos took on a Pune City side who they had lost to only once in eight encounters. Looking to start off the season on a strong footing, Delhi started the match brightly, having the majority of the possession in the opening minutes of the match. Linking up well to slice open Pune’s defence on more than one occasion, Delhi made sure the home faithful were treated to an attractive brand of football. Coming close to opening the scoring in the 11th minute, Delhi went onto create a bunch of chances throughout the first half. All their good work was, unfortunately, lead down by some appalling finishing with their Serbian striker Kaluderovic being the main culprit. Delhi’s spirit and the fine play was ultimately regarded right before the first half with them going onto take a 1-0 lead. Buoyed by the advantage, Delhi continued to maintain the pressure on their visitors in the second half and could have been well ahead if they had taken their chances. Making the most of Delhi’s failings in front of the net, Pune clawed their way back into the match. Latching onto the end of a loose ball in the final third, substitute Diego Carlos unleashed a shot to ensure Pune walked away from the match with at least a point. The manner the goal came about for Delhi will be hard for the team to digest. Old failings returned as the defence slept to let Pune through on goal, letting them find an easy way back into the match. With the goal, Delhi’s players’ shoulders slumped, knowing it was a match they should have long ago put to bed. Missed chances came to haunt the side back, something the team will need to work on if they are to have a successful season. Reflecting on the performance, Delhi coach JosepGombau said, “I think right from the second half we controlled the game and we had our chances. We had the chance to score two or three goals before Pune got their goal,” he said. “It was a good game to watch for the spectators, but I am not happy with the result. For more details on ISL 2018-19 Delhi Dynamos Vs Pune City and related updates, like and subscribe to tentaran.com.